Diagnostic Features - Antennae 11- or 12-segmented, with a 3-segmented club. Median portion of clypeus with two distinct longitudinal carinae; clypeus may also be concave between the carinae on the anterior margin, the carinae then project as a pair of blunt teeth. Eyes present. Promesonotal suture absent, metanotal groove impressed. Propodeum unarmed. Petiole pedunculate, node high and rounded. Postpetiole node less voluminous than petiole node in profile and narrowly attached to the gaster. 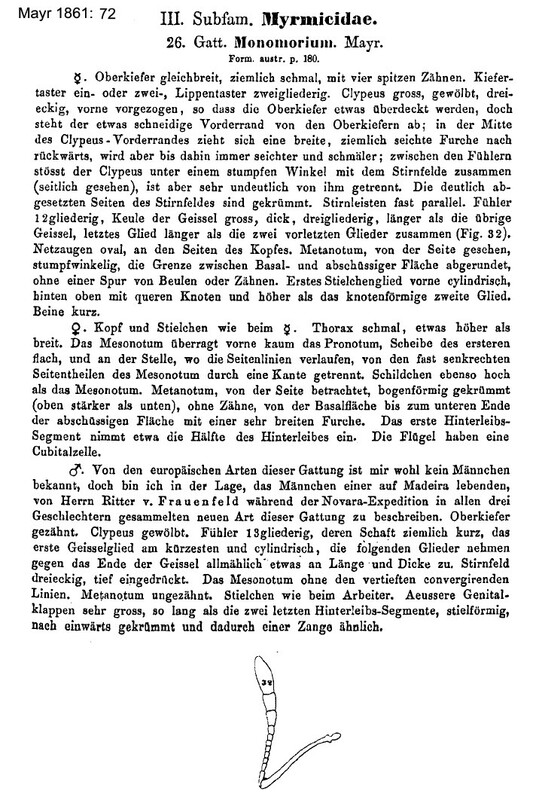 Mayr (1861: 71) reiterated his earlier (1855) genus description, this is at . 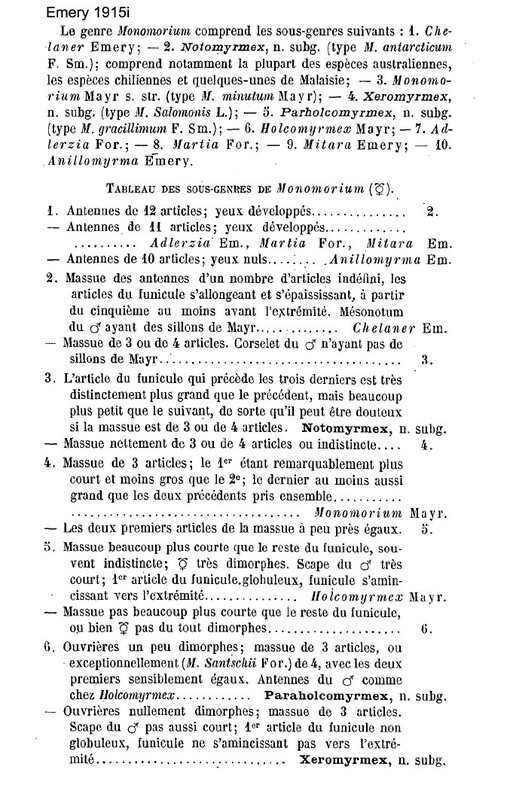 Emery (1915i: 190) listed what then were regarded as valid subgenera - and defined the subgenus Parholcomyrmex, type species Monomorium gracillima (as Myrmica gracillima, now a junior synonym of Monomorium destructor) - see . 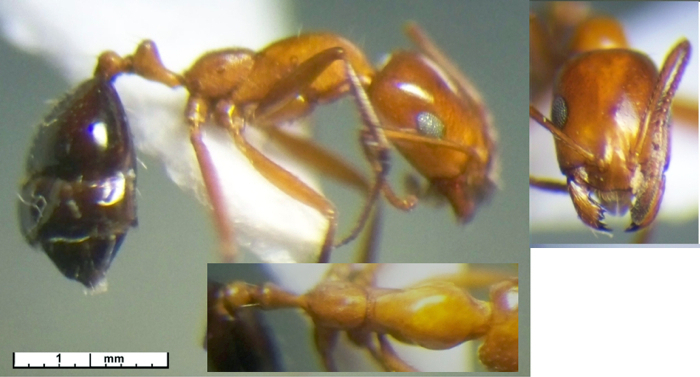 The main characteristics Emery listed were - slightly dimorphic workers; funiculus with a three-segmented club (Monomorium santschii with four segmented-club, type location Tunisia), the first two segments equi-sized.Emery (1922e) later synonymised Mitara with the older name Lampromyrmex, itself now regarded as a synonym of Monomorium. The subgenus Holcomyrmex was defined by Mayr (1879: 671) , type species Monomorium scabriceps (as Holcomyrmex scabriceps, type location India) - see Emery's key (1915i: 190) - Card 2. The main characteristics Emery listed were - antennal club much shorter than rest of funiculus, often indistinct; workers pronouncedly dimorphic. 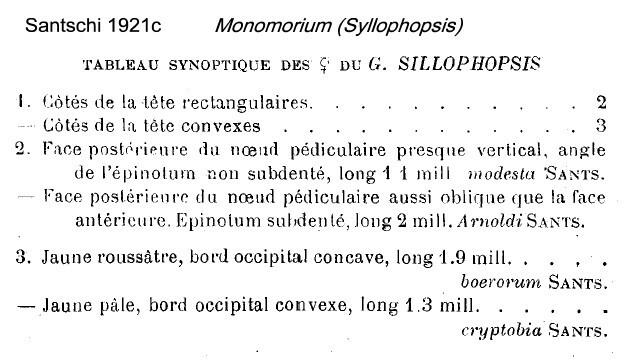 The Genus Syllophopsis was defined by Santschi (1915c: 259) and further tackled by Santschi (1921c: 119) - see and . Ettershank (1966) kept Syllophopsis separate from Monomorium but noted that he had not examined any specimens of Syllophopsis. Bolton (1987), however, synonymised Syllophopsis with Monomorium and he chose to set aside the concept of subgenera, instead using a format of species-groups, with a subordinate level of species-complexes. As a point of correction, Bolton (1987: 296) commented upon the subgenus Parholcomyrmex, as defined by Emery (1915i); writing that the name was - "also misspelled as Paraholcomyrmex later in the same publication". As the original text shows, it is obvious that Emery intended the name to be Paraholcomyrmex, literally (para-) similar to Holcomyrmex, as the name is printed in bold in the key, with the comment (translated) = male as Holcomyrmex. André (1883a: 330) gave a key to the species then known from Europe and North Africa this is at . Monomorium gracillimum F Smith = Monomorium destructor (Bolton, 1987: 324). 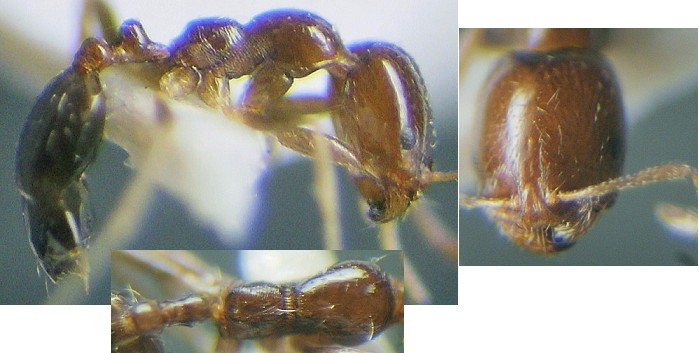 Santschi (1936a) attempted to sort out members of the subgenus Xeromyrmex Emery (1915), these essentially are members of the "salomonis-group" defined by Bolton (1987: 329). Unfortunately, although Bolton stated he had examined 15 extralimital species, in addition to the Afrotropical species dealt with in the paper, he has not gone on to publish modern descriptions of the extralimital species. 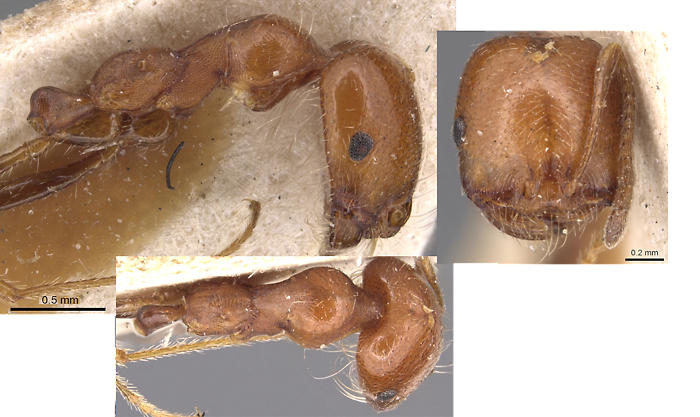 Menozzi's (1933b) key to Monomorium from Palestine is at . Thus, from Bolton (1987) the known Egyptian species fall into the species-groups as follows, except following the genus redefinitions in Ward et al. 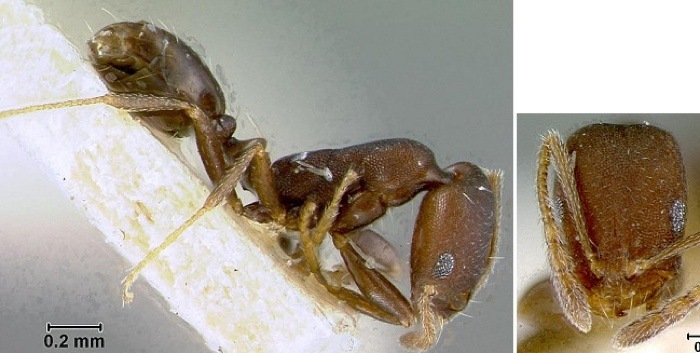 (2014: 10) the Trichomyrmex from Egypt are - abyssinicus, plus "destructor-group" members, destructor and mayri. - Head without psammophore hairs . - Head almost entirely shiny .
. Head almost entirely granulose-reticulate, no more than slightly shiny if not matt .
. Head only slightly elongated, CI 80 plus, oval with sides rounded; occiput not or only slightly impressed and slightly widest anteriorly .